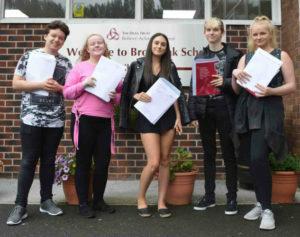 Broadoak School is delighted to report unprecedented success in this year’s examination results. Pupils have performed at levels above national averages in many subjects with outstanding performances in English, Mathematics and Science. There is a national drive to raise standards in all subject areas and Broadoak has shown once more that our pupils can compete at the very highest level. 56% of pupils achieved a 4 grade or above in both English and Mathematics. This is the second highest figure in the history of the school. Even more pleasing is the fact that a quarter achieved a grade 5 (which is a strong pass equivalent to a grade B) or above in both subjects. 66% of pupils achieved a grade 4 or above in Mathematics whilst 72% of pupils achieved a 4 grade or above in either English Language or English Literature. Just as impressive is the 61% of pupils who achieved a grade 4 or above in the new Combined Science GCSE. 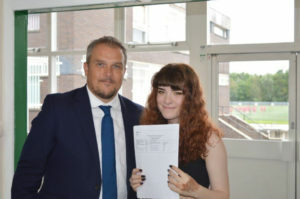 In terms of individual success, the highest achiever was Kayleigh Holland who accumulated 9 GCSEs including a grade 8 (A*/A) in English Language and Science alongside a further A grade in Digital Applications, a Distinction* in Business Studies and a grade 6 in Art. Other subjects that are celebrating fantastic results include: Art (100% at grade 4+), RE (100% 5+), Digital Applications (100% B+), ICT (100% C+) and we are very proud of our BTEC and Applied Learning pathways with 100% of pupils achieving at least a pass in Business Studies, Health and Social Care, Motor Vehicle, Construction, Engineering, Hair and Beauty and Music Technology.